As a well-known favourite in catering establishments across the UK, Lincat offers a range of commercial and catering pizza-ovens to cook all kinds of pizza, whether thin crust, deep pan, freshly made or frozen. 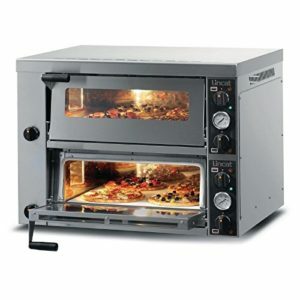 The Premium Range Double Deck Pizza-Oven is the ideal piece of equipment for a small restaurant or eatery, perfect for baking pizza, ciabatta, jacket potatoes, pasties and more. With separate thermostatic controls up to 480°C, each deck of this commercial pizza-oven operates independently, allowing you to have several pizzas on the go at once. This pizza-oven can accommodate six 9” pizzas or two 14” pizzas on its firebrick base: great for efficient preparation. Being double-glazed with toughened safety glass, the chef can keep a close eye on how the pizzas are cooking, all the while keeping the heat nicely insulated. This helps to improve energy efficiency, compared to a traditional open pizza-oven. Designed as a commercial countertop appliance, floor stands are available separately for the Premium Range Pizza-Oven should they be required. If you need more cooking space, it’s possible to stack two of these double deck pizza-ovens on top of one another. This commercial oven operates with a 20 minute timer for ease of use, so the chef can focus on other things while the pizzas are baking. The removable crumb tray is another very useful feature, making cleaning up at the end of the day much easier. As the self-proclaimed leading UK manufacturer of commercial catering equipment, Lincat is expert in creating quality products that stand the test of time. Its products are sold throughout the UK and in 50 other countries worldwide. 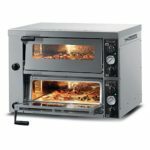 Lincat offers a two-year warranty on this stainless steel Premium Range commercial pizza-oven, including both parts and labour. While this 400V electric pizza-oven can reach very high temperatures between 80°C to 480°C, the only downside is that it needs 40 minutes in advance to heat up. However, once heated, the firebrick base ensures that heat is distributed evenly to give a crisp, all-over bake. The external dimensions of the Commercial Kitchen Pizza-Oven are 67.5 x 88.6 x 90. 2 cm. That’s a pretty large oven to fit onto a countertop, so make sure you measure your available space before ordering. The Premium Double Deck Oven can be delivered within 3-5 working days direct to your business premises. If you’re looking for a robust, high quality and reasonably priced commercial pizza-oven, this could be your answer.